Hollins Theatre is presenting a lively and novel production of one of William Shakespeare’s most beloved comedies. 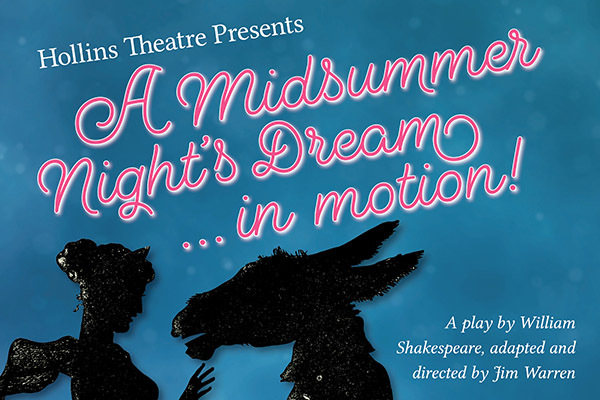 A Midsummer Night’s Dream…in Motion!, a 60-minute express version of the play that has been charming audiences for more than 420 years, will be staged as an immersive theatre experience in multiple locations throughout the Hollins campus, November 28 – December 1. “What a joy it has been to host this terrific Shakespearean artist here at Hollins,” Zulia adds. Admission is $10 general public, and Hollins students, faculty, and staff can obtain one free ticket each. For more information, call the Hollins Theatre Box Office at 362-6517.